Rene’ Panhard experimented with cars from 1888, having set up to build engines for Daimler 2 years earlier in 1886, in partnership with Emile Levassor. In 1891 they sold first the two cars, based on the Daimler engine they were building under licence, then 2 years later in 1893 they had sold 55 cars & 294 Daimler engines! Levassor obtained his licence from Edouard Sarazin, Daimler's agent in France. Upon Sarazin's death in 1887, Sarazin's widow, Louise Sarazin Married Levassor, and the deal was cemented. Daimler and Levassor became firm friends and shared improvements with one another. In 1891, the company built their first all-Levassor design, a "state of the art" model setting many modern standards, but each was a one-off design, They used a clutch pedal to operate a chain-driven gearbox. The vehicle also featured a front mounted radiator. This car had a 4hp 1.3 litre engine and sold at 3500Francs. 1893 saw the Panhard system becoming well established - Front wheel steering, front mounted engine with (chain) transmission to driven rear wheels and all the passengers facing forward.By 1894 Panhard were credited with the first modern transmission. The crude sliding-gear transmission would remain the standard untill Cadillac introduced synchromesh in 1928! 1891 was also the year Panhard 'shared' their Daimler engine licence with bicycle manufacturer Armand Peugeot who formed his own car company, dropping his experiments with Bollee inspired steam vehicles. Arthur Krebbs was a gifted designer for P&L and was responsible for the introduction of the steering wheel to all Panhards from 1898 onwards. He had succeeded Levassor as General manager in 1897, after Levassors death in April of that year, and remained in that position untill 1916. He turned the Panhard-Levassor Company into one of the largest and most profitable manufacturers of automobiles before World War One. By 1902 production had passed 1000 mark and cars were being sold in London by Hon.Chas.S Rolls, who also raced Panhards at the time. This model was built in the late 1990’s straight from the box. Nothing exceptional about that you say, well it’s not quite so easy with no instructions! For some reason none of the early EMK kits had instructions so Rod had to work out his own set of instructions by studying the parts and rare b/w photos of similar cars. All the painting was done by brush with Humbrol enamls. 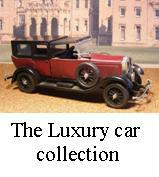 Again we ask you to remember the photos are enlarged the 1/32nd scale model is only around 10cm tall!